Because of the range of motion your shoulder enjoys, the socket in the joint is the shallowest in your body, making it subject to injury. A cortisone injection in the shoulder relieves pain and inflammation. A cortisone injection shoulder is almost as good as new, which is the reason to look into getting a shoulder joint injection when you have joint pain. The effects of a shoulder steroid injection last for months, too. Come to our sports injury clinic to get your pain evaluation and treatment. Meet our shoulder pain doctor Febin Melepura M.D. to get the pain relief you need in the safe, reassuring hands of the best shoulder specialists in NYC. It doesn’t matter whether your pain originated from an injury or from a medical condition like arthritis or tendonitis. Your pain and shoulder limitations are real, and you need relief. Consider getting a cortisone injection in the shoulder. If milder treatments like rest, ice and over-the-counter pain medications haven’t helped, a shoulder joint injection may be the next step. Many of these are serious injuries. Most of them can be treated. But your doctor won’t start off recommending a shoulder steroid injection. Treatment starts with an accurate diagnosis. Your sports and pain physician in New York City gives you a complete physical exam and then takes a full medical history, including how you think you may have hurt your shoulder. You may need additional tests, such as an x-ray, MRI or CT scan. Your doctor needs to be certain about your diagnosis before committing to a treatment plan. Sometimes, you’ll start with conservative treatment options: rest, ice, physical therapy and over-the-counter pain medicine. But if they don’t help, the next step may be a cortisone injection in the shoulder. While a shoulder joint injection isn’t a cure-all, it does help your shoulder heal from specific injuries and diseases. It definitely eases your pain and reduces the inflammation in your shoulder joint. With your pain reduced, you aren’t clutching your muscles constantly. With the inflammation down, your body can concentrate on healing. During your office visit, you’re made comfortable. You don’t need anything more than a topical local anesthetic. In some cases, you may need to lie on an x-ray table so your doctor can view live fluoroscopic images to guide the needle to the right spot in your shoulder. Your NYC sports and pain physician gives you the shoulder injections, often at multiple angles so that the medicine surrounds the inflamed area. The shoulder steroid injection contains some local anesthetic, which should relieve your pain immediately. The anesthetic wears off a few hours after the injection, though, so you may feel your old pain return. This is expected and temporary, as the steroid medicine takes several days to take effect. In the meantime, your doctor may give you some oral pain killers. After a period of observation, you’re free to go home. Once the steroid anti-inflammatory starts to work, it lasts for several months, giving your body time to heal naturally. A cortisone injection in the shoulder can’t repair a torn rotator cuff, but perhaps stem cell therapy or a platelet-rich plasma injection can help. Cortisone is a steroid drug that provides positive benefits in the short term, but your doctor knows you can’t have it too often. Too much can eat away at your cartilage, leaving you with arthritic symptoms. You can have multiple shoulder injections, but they need to be at least six weeks apart, and you can’t have more than three or four injections a year. Shoulder joint injections, therefore, are not suitable for chronic pain. To avoid these side effects, keep the injection location clean and dry. Don’t do any heavy lifting for a week; you need to give your body time to heal. Use a cold pack as needed. Call your doctor if your symptoms worsen. 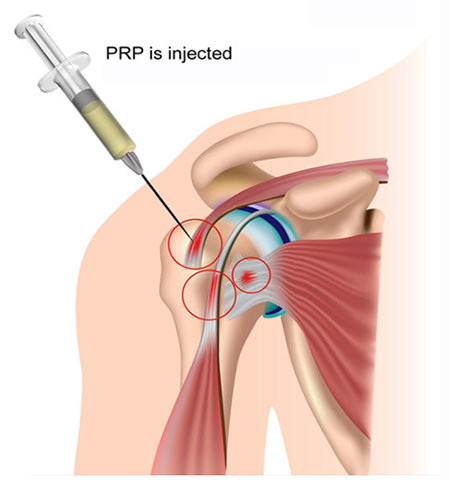 Do you have any questions about the shoulder joint injection (PRP) treatment for shoulder pain we offer in NYC? Would you like to schedule an appointment with the best rated shoulder pain management doctor Febin Melepura MD of sports pain management clinic in NYC? Please contact our office for consultation with the shoulder pain relief specialist in Midtown Manhattan.